One of the most dramatic sacred sites in Hong Kong, the Ten Thousand Buddhas Monastery is perched at the top of a hill in the town of Sha Tin. Visitors must climb more than 400 stairs to reach the temple and the famous nine-storey pagoda. The monastery actually contains nearly 13,000 Buddha statues within its walls alone, and many more stand sentinel along the pathways and stairs. The statues come in a great variety of shapes and sizes and the temple complex is breathtakingly colourful with beautiful views. Sadly, there are no resident monks and the temple is managed by laypersons; you do not therefore feel as though you are visiting an active monastery. 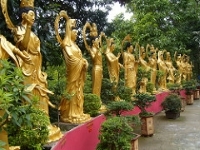 However, unlike many famous temples in Hong Kong, the Ten Thousand Buddhas Monastery has retained its tranquil atmosphere and still feels like a holy place. It is not commercialised and is seldom swamped by crowds. This is partly why it tends to make such an impression on tourists. There is a small restaurant selling simple refreshments at the top but it is advisable to bring your own water for the climb, which some find tiring. In some parts of the complex photography is not allowed - be sure to take note of the signs. Transport: Take the East Rail line to Sha Tin.